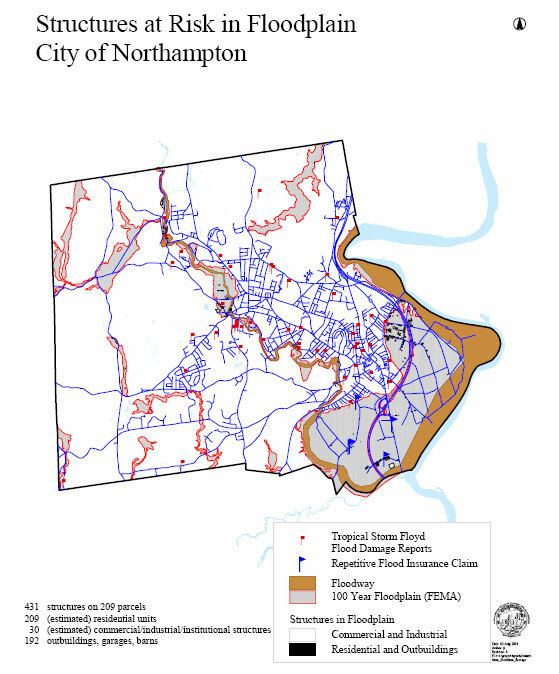 On September 2, 2004, the Northampton City Council approved a Flood and Natural Hazard Mitigation Plan (PDF). The Project Manager for developing this plan was Gloria McPherson, Conservation and Land Use Planner. Ms. McPherson now works for Kohl Construction. Here are key highlights from the plan with respect to NSNA’s objectives, followed by an expanded overview. 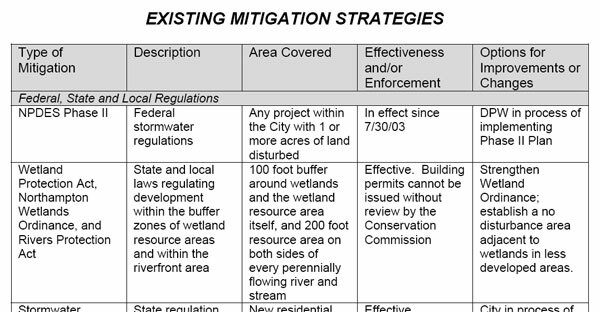 In a table of Existing Mitigation Strategies, the plan includes a “100 foot buffer around wetlands and the wetland resource area itself…” It says this strategy has been “Effective”, and says that an option to improve it would be to “Strengthen Wetland Ordinance”. This is a far cry from more recent assertions by Northampton planners that it has been a common practice in the city to allow developers to encroach as close as 10 feet to wetlands, and that the people should not be concerned if this practice is enshrined into law. It is well known that some of Kohl’s land contains fill from work on Market Street, dumped there in the early 1980s. Kohl’s own Request for Determination of Applicability notes, “The wetlands are degraded with masonry and other construction and road building debris.” It seems plausible that parts of Kohl’s property meet the definition of a filled wetland. The plan expresses concern for wildlife habitat, including vernal pools. “While areas containing significant wildlife habitat are not considered hazardous in the traditional sense of potential impacts to persons and property, when viewed in the larger context, it is land that is inappropriate to develop because of potentially long-ranging and significant impacts to the biological community and, in turn, to humans who are an integral part of it…” (p.24) Vernal pools are likely to be found on Kohl’s property. This will be investigated more thoroughly in the spring of 2008. Here are more expanded excerpts from the plan, which foregrounds the importance of prevention in flood mitigation. We have emphasized certain passages with bold type. The City of Northampton has developed this Flood and Natural Hazard Mitigation Plan to address natural and manmade hazards and to plan for the future of areas prone to flooding. Flood hazard areas are found in the Meadows along the Connecticut River and along the Mill and Manhan Rivers. There is also localized flooding associated with the stormwater drainage system. Natural hazards can be exacerbated by societal behavior and practice, such as building in a floodplain and increasing the amount of paving in a watershed. …It is necessary to find approaches to reducing flood and natural hazard damage that are simultaneously effective, equitable, economically reasonable and environmentally sound. Adoption and implementation of management strategies will depend on their ability to successfully mitigate environmental hazards while satisfying additional ecological and cultural functions, such as providing wildlife habitat and protecting open space. The City of Northampton can choose from and institute a variety of structural and non-structural hazard mitigation measures. Structural measures may include drainage modifications, the construction of dams, dikes and other capital improvement projects that protect buildings and infrastructure from the forces of wind and water. Typically they are used to prevent a natural hazard from reaching property. Most structural projects are expensive to build and maintain and have other shortcomings, including the destruction of farmland and wildlife habitat and increased erosion downstream. Non-structural strategies do not change the natural hazard, but involve preventative actions that improve infrastructure’s ability to reduce the damages, or improve coordination of resources. Non-structural measures include building codes and inspections, floodplain zoning, development regulations, acquisition of hazard-prone properties in fee simple or limited rights (such as Conservation Restrictions and Agricultural Preservation Restrictions), setting preferential tax rates for agricultural lands to discourage development in hazardous areas, open space preservation and wetlands protection. In order to meet this goal, the City must ensure that flood and natural hazard mitigation is adequately addressed in City regulations, particularly the Comprehensive Plan, Subdivision Rules and Regulations, Zoning Ordinance and Wetlands Ordinance, and that mitigation consideration is included in the evaluation and prioritization of public policy initiatives, such as public land acquisition. 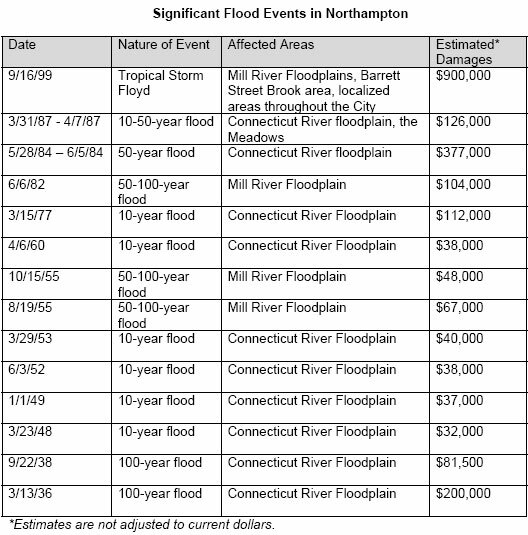 In this chart of significant floods in Northampton (p. 19-20), we note that Tropical Storm Floyd caused damage in the city comparable to or greater than that of the legendary Hurricane Diane in August 1955, underscoring the potential seriousness of localized flooding outside of the more obvious risk areas like the Connecticut and Mill River floodplains. Some areas of Northampton contain critical wildlife habitat, including 29 state-certified vernal pools that support a variety of rare and endangered species. 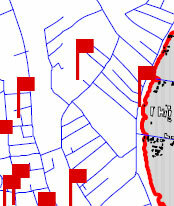 There are also 20 identified potential vernal pools. In addition to flooding from hurricanes and northeasters, Northampton is also susceptible to flooding from severe rainstorms and thunderstorms. The occurrence of significant rain events in the City has been increasing over the past several years. 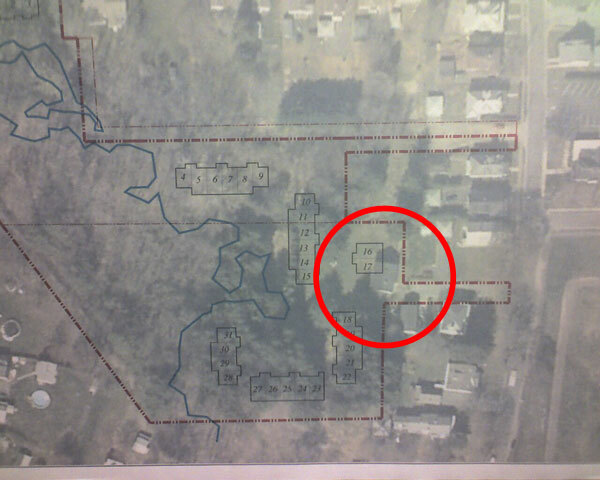 Kohl Construction proposes to build 31 condo units in the forest between North Street and the bike path. This development, with its access roads and 66 parking spaces, will claim 5.49 acres of land…. g in wet periods and more severe dryness during droughts. Infill sounds great on paper, but when it means paving over green space in downtown Northampton, it runs contrary to sound flood mitigation practice. The reality is that much of the remaining green space in downtown is in low-lying areas that are most susceptible to flooding. It makes sense to go along with the collective wisdom of the past 350 years and leave them undeveloped.